HOUSTON - The second-oldest Division I Football Championship Subdivision rivalry in Texas will have a new home at Reliant Stadium beginning next season, Lone Star Sports & Entertainment (LSSE) announced today. 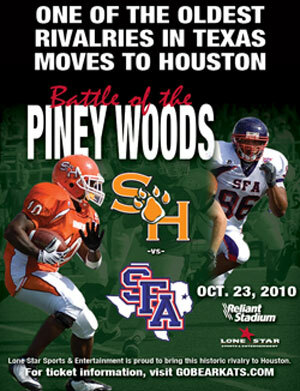 Sam Houston State and Stephen F. Austin will face off in the Battle of the Piney Woods in Houston on Oct. 23, 2010, and for three years following. "The Battle of the Piney Woods is one of the great traditions in college football in the state of Texas, and we are proud to bring it to Reliant Stadium," said LSSE president Jamey Rootes. "We want to make Reliant Stadium the premier venue for every level of college football in Texas; and this rivalry brings us one step closer to that goal." 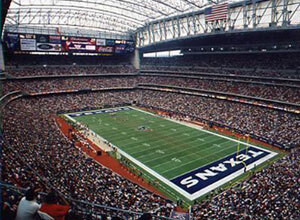 Game organizers plan to open Reliant Stadium's lower bowl, which seats approximately 26,000, for the game. "We are excited about partnering with Stephen F. Austin, Lone Star Sports & Entertainment and the Houston Texans to take this historic rivalry to Houston," Sam Houston president Jim Gaertner said. "Reliant Stadium provides a terrific atmosphere for football, and I know the students, alumni and fans of both schools will enjoy a great game-day experience at each of the games that will be played there over the next four years. Playing at Reliant Stadium in the nation's fourth largest city will provide enormous exposure for our football team in terms of donors, marketing, recruiting and prestige," he said. The Battle of the Piney Woods dates back to 1923, with Sam Houston State holding a 48-33-2 edge in the series. The Bearkats have won the last five meetings, with the 2009 edition set to take place next Saturday, Oct. 24, in Nacogdoches. "This is a terrific move that is going to bring one of the most exciting college football rivalries to Houston, the back yard for almost a third of our university's alumni, students and fans," said Sam Houston State athletic director Bobby Williams. "More than 58,000 members of the Sam Houston Alumni Association call the Greater Houston area home. This is an opportunity for them to step up and show their Bearkat spirit. "It is especially meaningful that LSSE and the Texans contacted our universities about moving this series to Reliant. That shows what high regard they have for this fantastic rivalry between two universities named for two of the most historic figures in Lone Star State annals." Sam Houston State head coach Todd Whitten knows the "Piney Woods" rivalry from both sides. Whitten was an All-Gulf Star Conference quarterback at SFA from 1983-86 and still ranks second on the school's all-time passing list with 4,026 career yards. He has been head coach at Sam Houston since 2005. "The Battle of the Piney Woods is a game that turns out students and alumni from both universities," Whitten said. "I believe this is only going to add to the great tradition of this rivalry." The Sam Houston vs. Stephen F. Austin match-up will be one of three college games hosted at Reliant Stadium by Lone Star Sports & Entertainment next season. Rice will play its home game against Texas on Saturday, Sept. 4, and the 2010 Texas Bowl will pit teams from the Big 12 and the Big Ten against one another in late December. "The fact that six of the last eight games in the series have been decided by less than a touchdown shows you how competitive this rivalry has become," Williams said. "Last year's 34-31 thriller wasn't decided until Sam Houston kicked a field goal in the second overtime period. We're excited about bringing this fantastic rivaly to Houston fans." Lone Star Sports & Entertainment is an independent event management company which is closely affiliated with the NFL's Houston Texans. Since being founded in 2003, LSSE has established itself as the leading sports event promoter in Houston. LSSE moved into the world of college football in 2006 when it established the Texas Bowl. In its three-year existence, the Texas Bowl has generated an average of $25 million in local economic impact in the Greater Houston area. The Texas Bowl has grown its season ticket base to more than 20,000, a number which is on par with BCS-level bowl games. LSSE has delivered four of the five largest crowds to witness soccer matches in Texas history, all within the last five years, including the 2006 FC Barcelona United States tour, the 2005 and 2007 CONCACAF Gold Cups, and international friendly matches between the United States and México in 2003 and 2008. Last year, LSSE branched out into the concert industry, bringing Kenny Chesney's Poets and Pirates Tour to Reliant Stadium. LSSE has also worked closely with the AVP Crocs Tour and the PGA Tour's Shell Houston Open with local marketing and promotion.